There are two ways to eliminate a tree stump. One, you can physically remove it and its major root system with a backhoe, but this often significantly damages the surrounding lawn area. Two, you can grind the stump with a stump grinding, removing all visible parts of the stump to 3-6 inches below the ground. Removing a stump is often only done when there is foundational work to be done in the area, such as a house foundation or road work. For this reason, most home and business owners opt to have stumps ground. Grinding a stump isn’t difficult with the right equipment, but it still can be messy and somewhat damaging to the surrounding area. However at Timberlake's we take great pride in making the tree stump grinding process easy and clean. 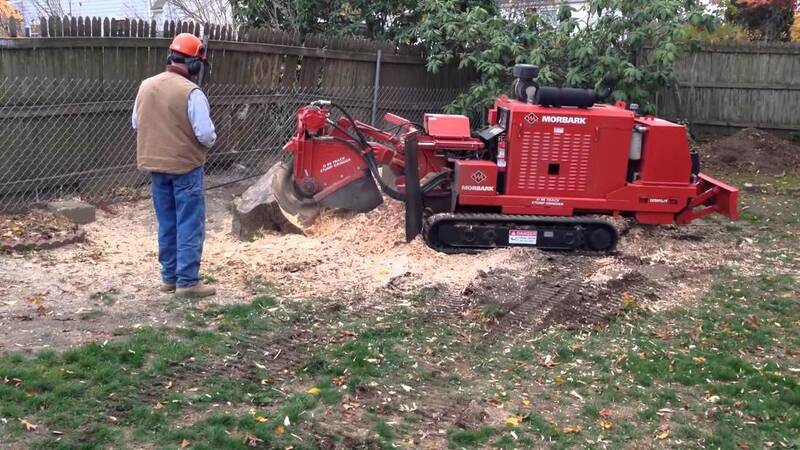 Using one of our Morbark or Veneer stump grinders makes short work out of most stumps. The track or damage left to your yard and landscape is minimal the stump grinding process will leave the area pristine and ready for planting seed, sod, or other landscape plantings. Tree stumps range from easy to grind to a bit more difficult. This variability is driven by stump size, age, and species of tree. A new hardwood stump of a considerable size is the most time consuming to grind, due to the density of the wood fibers. Pine and cedars (conifers) – are the easiest stumps to grind. Age also matters as some natural drying and decay aid the stump grinding process of older tree stumps. Certainly the size of the stump is the most significant factor in cost to grind a stump. And lastly, the species of tree is a factor as some trees have deep roots systems while others are shallower. However, regards of the age, species, and size of your tree stump, we can make short work out of any stump. One final note, please never use an unlicensed and uninsured tree service company for this work. While the process and equipment are not overly dangerous, accidents can happen whenever you are using equipment of this type. If you use an unlicensed and uninsured tree care company, you expose yourself to financial liability should an accident happen on your property. If it does, you will liable under your homeowner's insurance policy. Using hand tools, such a rakes and shovels, we will clear the stump area of loose rock, dirt, and wood, making the area as clean as possible before grinding. If the stump isn’t already cut close to the ground, we will use a chainsaw to cut the truck of the tree down as close as possible to the ground. This will reduce the amount of wood material needed to be ground, saving you money and time. We then move the stump grinder into place over the stump, lower the cutting blades into it to begin the grinding process. Finally, we will clean the entire area of the wood chips, either piling them for you in a convenient place or taking them with us to be recycled. ​From start to finish, the process will take from 45 minutes to 2 hours, depending on the nature of the stump. We offer multi-stump discounts if you have more than one stump to grind, as we too save money in not having to travel to do another stump. Please call Timberlake's Tree Service Chesapeake if you need stump grinding service that is professional, affordable, and fast.